My newly built fanless was nice, but I could still hear my NUC if listened closely. During my investigations I noticed the fanless cases from Akasa, including replacement cases for various NUC motherboards/kits. After wondering if I maybe shouldn’t replace my NUC I eventually decided to just buy a new fanless case for my existing NUC. The reasoning was quite simple, the Akasa case was 51.96 EUR including shipping. Any other solution would probably be much more expensive. The next thing I want to replace is my current mouse. The mouse wheel has been giving issues since forever and the mouse gives off a light. I tried investigating the best possible replacement but there’s too many options. Plus it’s difficult to easily filter out the irrelevant options. Eventually I noticed a fairly cheap somewhat silent Logitech mouse. A quieter mouse fits with my fanless cases so I bought that. The website said it does next-day arrival.. it didn’t arrive the next day. Shortly after I assembled my current/old pc the older pc died. I intended to have two and ended up with only one; my NUC. With memory prices slowly dropping to more affordable levels I decided to assemble a new pc. I tried to go for components with a good price/performance. I don’t want to spend 50% more for maybe 10% more performance. Next to price/performance I opted for an AMD CPU because Intel has so many more security issues. I went with a 1TB SSD (SATA because of price/performance), 65W TDP AMD Ryzen with integrated GPU, a mini-ITX size motherboard with good 5.1+ sound, plus a fanless case. PSU wise I found a laptop-like PSU/charger which needed a DC-DC converter. The result is an utterly quiet pc. I did a stress test and checked the temperatures. Everything seems ok, though wonder how things will be during summer. I quite like the lack of any noise. My existing older pc is a NUC with a slowly spinning fan. I noticed a company making fanless cases for pretty much all NUC models. I’m wondering whether to make my existing NUC fanless, or maybe do something else. Installing Mageia was annoying. Latest stable didn’t work, latest beta same. Eventually ended up installing it via internet (net install). Before buying all the components I wasn’t aware something like fanless existed for such a CPU. It’s nice to do the research and make a pc which mostly follows the tips I found, my preferences and the trade-offs I had to make. Price wise I spent about 800 EUR on the various components (I didn’t list all of them). In case people want to know the exact components I’ll put it into the comments (update: had to put it under the “more” link). I’m trying to avoid making this appear as an advertisement. Within Netherlands each company is by law required to have first responders. These handle various situations until the professionals arrive. It’s usually one of (possible) fire, medical or an evacuation. Normally I’d post this at Google+ but as that’s going away I’m putting the details on this blog. I prefer writing it down so later on I still can read the details. While chatting to security a maintenance guy arrives and mentions a suspicious package he noticed. Package is described as a huge suitcase left underneath a staircase. Location wise it does not make any sense to place a suitcase there. My suggestion to security is to evacuate the entire building. Security deems otherwise and wants to have a look first. My interest immediately fades and I prefer going for lunch. Security asks me to join the investigation, which I do. Package itself is hidden underneath the staircase. Going against pretty much any suspicious package procedure security moves the suitcase closer. We notice a checked in luggage tag on it. Security opens the suitcase (despite any suspicious package procedure will tell you not to move or touch it! ), contents reveals yet another suitcase as well as an iPad. Name on the tag is a super generic name. Using a walkie talkie security communicates internally for the name on the tag. Again, you’re not allowed to use communication devices in case of a suspicious package. Security relays back that they’ve found a likely match. Package is deemed harmless. We then move the package to a special blast resistant area within the building. The building was built around 1980 and during that the company in charge was highly profitable and did business in pretty interesting countries. As result of both, that company requested to building to be as safe as possible. Building safety requirements have been become much more strict since 1980. The building has fulfilled these stricter requirements since the opening. Security does their security thing: Ensure that they’ll “have a chat” with the person involved. I go for lunch. Once back I overhear a pretty anxious person explaining how he messed up. I relay that information back to security for their amusement. Around one week ago I was early in the office. I noticed a security person and someone from the facility company taking an elevator. Unusual, but it might be something they do every day in the morning. Ignored it and swapped my sweaty clothes (cycling). When I finally arrived near my desk I heard sounds coming from my walkie talkie. Once closer, I overheard communication regarding people stuck in an elevator. Head of security mentions he’s about to turn off the power to the elevator (this normally opens the doors). Turning off the power is what’s done after various other checks. As I do not want to miss any incident I asked for the floor number; it’s one floor down. I expect to arrive after everything is over. I arrived near the elevator and the people weren’t rescued. This as the doors refused to open. An elevator has various safety systems; basically in case it’s exactly on a floor turning off the power results in opened doors. This method we’ve used various times to rescue people. Another option is to override (part of) the safety system by use of an elevator key (these keys can differ per elevator). Using the key is a bit tricky; you need to use the right amount of force else it doesn’t work. As the doors do not open we try a few things: Turn power back on and the left doors opens maybe 5cm (when pressing doors open button), right door doesn’t move. Turn power back off and then use the elevator key results in a gap of less than 1cm. There are two people within the elevator whom we keep giving updates. We ask how they’re doing and the response indicates they’re not worried at all. In case they’re anxious we’d call the fire brigade (closest one is a 6 minute non-priority drive away). As the people are relaxed we opt for the elevator maintenance company. They estimate it’ll take around 20-30 minutes for them to arrive. We get some guidance via phone; basically everything we tried already plus one thing we do not want to do. Meanwhile someone from an auto repair shop also arrives. Apparently he needs to get the car keys from someone in the elevator. I give the car mechanic some coffee and tell him to make himself comfortable. He’s quite enjoying himself and mentions that the office is way nicer than anything he’s been to before! Eventually the elevator mechanic arrives. He mentions he’ll go up and sort it out. I thought he meant up to the maintenance room but he really meant to physically go on top of the elevator. My first thought that this is really unsafe, followed by “he’s an elevator mechanic and knows what he’s doing”. He moves the elevator to another floor and the doors open. After that he figures out the problem; one of the outside doors is stuck in a rail. He fixes this and then double checks what the elevator reported as reason for going into failsafe mode. The causes matches with what we observed. The elevator key is on the outside door on the right. The only door which opened was on the left. There’s all kinds of interactions between the outside and the inside doors (due to safety). Only on that floor one of the outside doors had an issue. The inside doors (which move with the elevator) didn’t have any issue. Explaining this it’s quite easy. However, we were quite stumped. We used to actually do more to get a person out. E.g. manually move the elevator. We stopped doing this because despite knowing exactly what to do (elevator company gave thorough explanation) as there’s no guarantee that we won’t be held responsible in case something bad happens. Unless there’s a safety reason we will not do more than power / elevator key methods. Back at my desk I mentioned that we got two people out of an stuck elevator. My colleague turned white and took the stairs for the rest of the day. Within Netherlands each company is by law required to have first responders. These handle various situations until the professionals arrive. It’s usually one of (possible) fire, medical or an evacuation. Normally I’d post this at Google+ but as that’s going away I’ll put it on this blog. I prefer writing it down so later on I still can read the details. 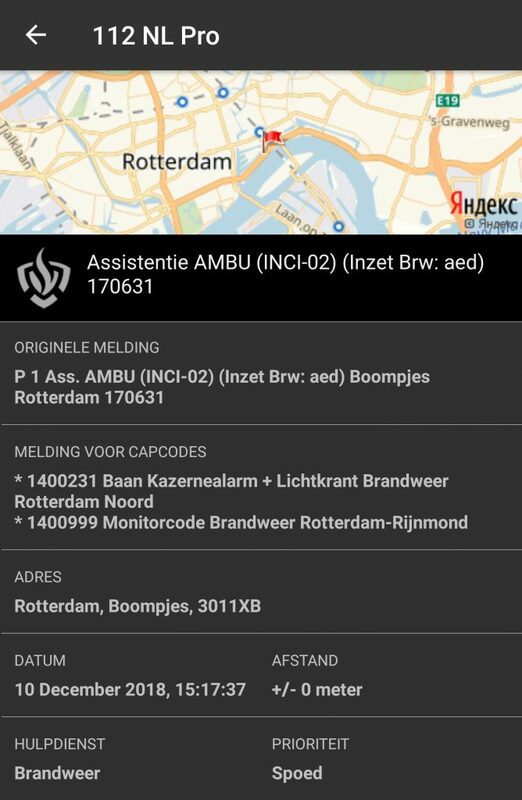 While in a meeting I get a notification from my P2000 monitoring app (screenshot below), then a notification from the Dutch CPR app that there’s a need to perform CPR at work. The CPR app gives the exact address. I realize that I forgot my walkie talkie, plus my pager didn’t go off. I run out, I hear my colleagues explaining to others why I suddenly run out. I’m wondering if to call security or to get my walkie talkie. I decide on the latter, security is usually busy enough during incidents. I make a mistake going to my floor, then to the correct one. I get my walkie talkie and ask for instructions. Incident is on 3rd, but I need to go to reception. I fetch an AED. A fellow colleague and first responder notices that and joins me. We go to reception (ground floor) but that was a miscommunication; we needed to go to reception 3rd floor. I’m not entirely happy with my mistakes. While going back to 3rd floor we get an update, person is conscious. We arrive to 3rd floor and are directed towards the person. There’s loads of people around, actually too many. I stay at a distance, my colleague gets closer. A more experienced first responder is closer and asks my colleague to stand a bit away. I’m very happy that despite the mistakes everything is under control. Me and my colleague decide to assist with waiting for an ambulance. This despite not having a bright jacket, nor my jacket (it’s cold outside). I might at least get a bright jacket from security, having this on is pretty critical. At the same time we overhear that the ambulance arrived. Using what security taught me in a previous incident we reserve an elevator to make it respond only to the buttons on the inside, not to anything else. We further overhear that the ambulance arrived to the wrong part of the building, this means that we will have difficulty getting the stretcher up to the incident. We guide the ambulance personnel inside the building without the stretcher. While passing the reception I notice ground floor reception is talking to someone who is a relative/loved one/etc. We ask all of them to follow us inside the reserved elevator. The ambulance personnel is relaxed (as always! ), they casually ask us to bring us the stretcher after. We were already planning to do this. Together with my colleague we go down to ground floor to fetch the stretcher from floor -1 somehow. The stretcher needs go up one floor. At this point I’m not entirely sure how to do that, we need more people actually. We discussed this various times but the idea was to have 5 people, not 2. While walking to the stretcher we see 3 people actually carrying the stretcher up a staircase (from -1 to ground level). The goods elevator meanwhile is reserved but standing at -1. I ask it to be redirected to ground level. No response. We arrive with the stretcher to goods elevator, it’s still at -1. We ask again, seems the new goods elevator system is annoying to use. Goods elevator arrives, there’s some people inside which we get rid of. Later I hear that those people were a bit overwhelmed. Using the goods elevator we take the stretcher to 3rd floor near the incident and then wait at 3rd floor reception. Reception has a few people, at least one person was shaking a bit due to emotions, we try and calm the person down. After that my colleague goes back to work. Eventually I guide the ambulance personnel without a patient back out of the building . Fortunately no CPR and I’m quite happy they didn’t need to take anyone with them. While closing the doors of the good elevator a big wooden pallet almost falls upon me. Entirely dangerous! I later notice that this took the walkie talkie off my belt… so for a while I’m searching for my walkie talkie. After this I go to my colleague to talk everything over for a bit, followed by discussions with others as well. Various good things and also various improvement points. Within Netherlands each company is by law required to have first responders. These handle various situations until the professionals arrive. It’s usually one of (possible) fire, medical or an evacuation. Normally I’d post this at Google+ but as that’s going away I’ll put it on this blog. I prefer writing it down so later on I still can see the details. While standing a bit away from my desk it seems security (via the walkie talkie) asks for either me or Tim. I didn’t hear my name properly, but I’m pretty sure I heard them call out for Tim. After asking to repeat I get sent to 10th floor and informed that another person is also underway. There’s an ambulance underway and that’s basically all the information available. I take a bright jacket, AED and run to 10th floor. I arrive at the same time as another first responder. Strangely nobody seems stressed. No group of people anywhere, etc. Though the floors are huge it usually only takes seconds to figure out the location of an incident. We ask around and nobody seems to be aware of any incident. We advice security and get sent to investigate on 9th floor. Apparently the floor number was unknown and this company is located on two floors with the majority on 10th floor. On 9th floor we notice the issue quickly and advise security. Just after we overhear (walkie talkie) the arrival of a rapid responder. The incident is quite easy, the person is lying on the floor with a coolpack, conscious, did not lose consciousness and just tripped because of a slippery floor. Such an incident could be more serious, it’s quite possible that some kind of problem in their brain caused them to lose consciousness and that resulted in a broken ankle. During the last first aid refresher course they taught us to be aware that the real cause might be a bit different. As the rapid responder is already within the building I decide not to treat the ankle. The ankle was already being cooled and it seems better to leave it to the professionals. Someone asks for a update to relay to the rapid responder, I respond and keep it brief. Meanwhile more first responders arrive as well as interested colleagues. As per a tip from another first responder I give all kinds of tasks to the newly arrived first responders. One I ask (tell) to get all other colleagues away. Another is sent to get the persons jacket. Yet another is sent to the elevators to guide the rapid responder towards the incident. Once the professional arrive we stand at a distance. We discussed if we should ask the rapid responder if he requested an ambulance but it was decided to better not to ask questions unless you really need to. This especially as the rapid respond is on his own. We prepare for a possible ambulance to arrive. This as a rapid responder (either motorcycle or a smaller car) cannot move people. It’s a bit overkill to use an ambulance for a broken ankle, but oh well. I volunteer to wait for the ambulance in the cold. Apparently there’s a reserved elevator which I can use (one which only responds to buttons within the elevator). Outside I see that the rapid responder parked in an interesting location and it might make things difficult. 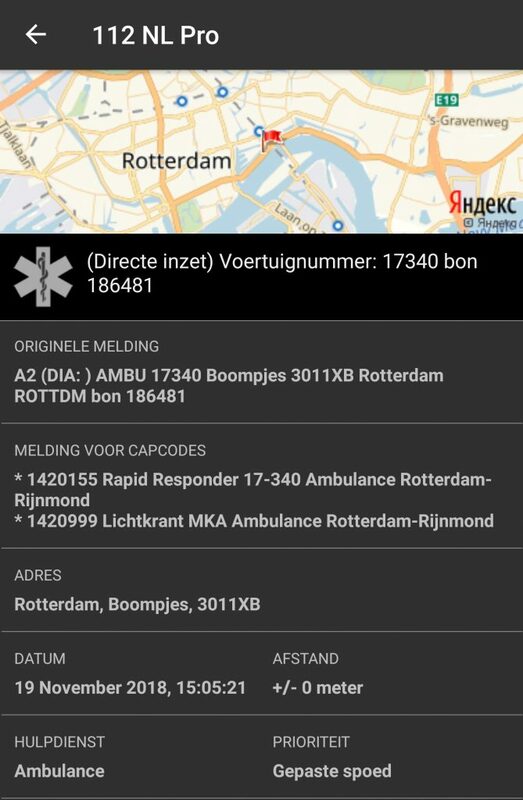 I check for any ambulance calls on my app, plus change the app to show me non-priority calls as well. If an ambulance comes I’ll need to ask for a lot of assistance. We had enough which responded. After standing outside for a while I hear that the plan changed. The reserved elevator needs to go back to 9th and they’ll use a chair to move the person. On 9th floor I had to wait a while so to kill the time I ask how to reserve an elevator. I only know how to takeover the emergency elevator. Taking over a random one? I thought only security could do this. Tim explains it to me after which a bunch of people arrive, including someone in a chair. We guide the person downstairs. Person is then brought to the hospital by a colleague. We aren’t sure why the rapid responder didn’t bring the person. After the incident security ensures I can also reserve elevators. During the whole incident we only used walkie talkies. Another way is pagers, worn by more people than the usual first responders. The pagers have as drawback that you might get an overkill of first responders. We recently changed procedures to optimize this a bit. It’s still nice to see how many responded just based upon walkie talkie usage. While having lunch I noticed a notification about the fire department going to my (huge) office building. As this was during lunch time and there might be way less first responders available I headed back. 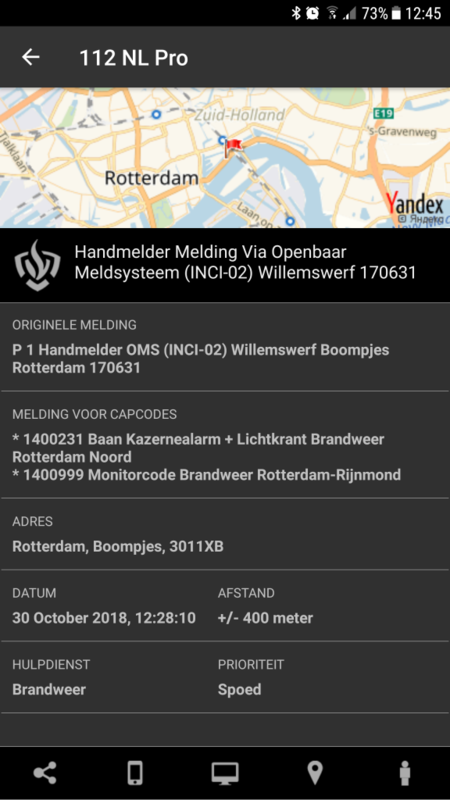 The message says “Handmelder” which is Dutch for those manually operated red boxes. As these are manual the fire department assumes someone verified that there’s a fire. According to Google Maps the fire department is a 7 minute drive away, so a maximum of 5 minutes for them. I saw them using a road which was partly closed for construction. A bit strange as they’ve been informed & there are signs. Anyway, I went inside. At this point I don’t know much. You hear people asking what is going on. I can guess but better not to assume too much. I do see that one of the fire doors closed itself. I notice the lack of an evacuation alarm though the pager indicated it’s either cellar, parking level or ground floor. To help out I need a bright vest and a walkie talkie. The bright vest is very important a) for fire department to recognize whom to approach b) force people to listen to me. A walkie talkie I have at my desk, that’s useless as the elevators won’t work, I have no idea what is going on and it’ll take forever using the stairs. To start I take a bright jacket as well as ask and get for a spare walkie talkie from security. It takes a bit until I notice the walkie talkie battery is dead. I want to find another but there’s 2 unneeded people in the security room standing in the way so quickest is to ask again. Normally security is a hell during these things so I really don’t want to distract security. Fortunately there’s another working walkie talkie. I announce myself and ask for instructions. I get told to check parking level 4 east side. Normally I easily know east vs west but at the moment not so much, I’m more thinking on how to approach safely but quickly. Last week security mentioned that the new fire detection cables have east and west mixed up. It seems easier and safer to check the entire parking level. On parking level 4 I initially see nothing strange plus I’m the only one. This is strange as I was late to arrive to the incident. I missed all of the previous conversations. It’s a waste of time to ask about this so I skip it. I don’t see any fire at all, though there is a hell of a noise. I first check if it’s one of the cars (super easy). Nothing. There’s also various doors for building related things. Normally I’d have keys for that but alas, not now. I relay that first impression is no fire. I get told to check everything as per request fire department. I don’t get why they don’t come up but pointless to wonder. It takes me a few minutes to check the various doors. I check for fire indicator lights (fire behind a door) as well as a door check (heat, smoke). Nothing to be seen. Meanwhile a car enters the parking level. That should not be possible and usually cannot be done (parking gates close). Something to tell security. I communicate that nothing found except a really loud running airco. As of a month ago the building has a fire detection cable on all parking levels. It is very sensitive to temperature changes. It’s also installed above the parking places close to two airco outlets. They thought ahead of the potential problem and they said they addressed it (made it less sensitive). My guess is that it’s still too sensitive. One incident leads too loads of questions. Some answered during the incident, some just after, some take a while. There’s been enough learnings in this one. 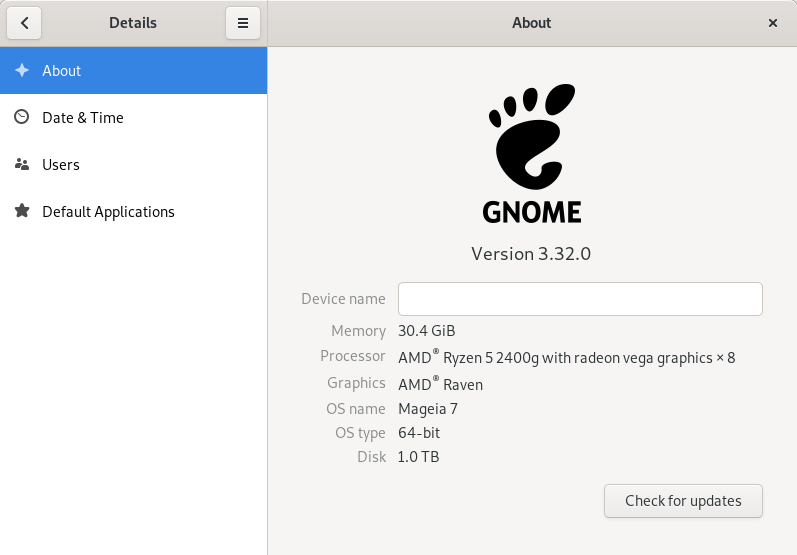 One of the criticisms towards Wayland is the lack of a Window Manager concept. This to have an option of a different window manager behaviour/experience without needing to write a whole compositor as well. On LWN, daniels confirmed that it’ll become easier with time thanks to libweston. > Not exactly sure what this allows, but I assume that most of the compositor logic is in this libweston, thereby reducing the complexity creating a different Wayland compositor. Correct. The idea is to let people write window managers and desktop environments without having to worry about the details of DRM/KMS/GBM, EGL, dmabuf, the Wayland protocol itself, and whatever other plumbing. It’s not there yet, but hopefully in the next year or so it’ll become a really solid viable alternative. The secret santa even included a poem with the request to send pictures of me and the gnome during my travels. 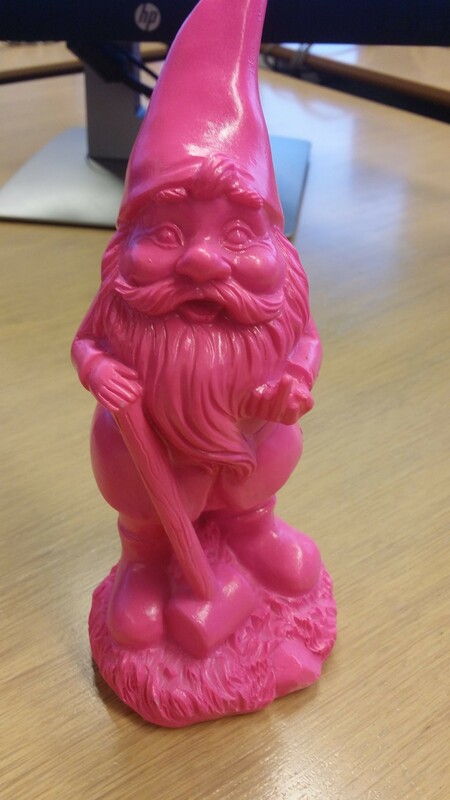 Anyone remember the traveling gnome that we used to see on Planet GNOME? Apparently Googling ‘GNOME’ doesn’t really explain what is meant with ‘GNOME’ Aside from above gnome I also got a ‘The best places to be today’ from Lonely Planet!! Also, look carefully at the picture.